I haven't needed to water my plants for over a week because we've received plenty of rain around our area. In fact our lawn is starting to look like an untamed jungle, much to my husband's chagrin. It has been raining so much that I wouldn't be surprised if it started raining food! My favorite activity on a rainy day is sitting down with a good book. 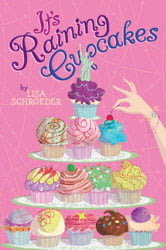 I just finished a cute middle grade novel titled It's Raining Cupcakes by Lisa Schroeder, a perfect girly diversion for a rainy summer day. From the scrumptious pink cupcake laden cover to a well-written plot with chapter titles named after different cupcakes, the book is a treat to read. "My family needed the cupcake shop. Because we needed to be brought together." One summer, a twelve-year old girl named Isabel finds her life as mixed up as a batch of cupcakes. Her mom, on a whim, decides to renovate a Laundromat into a cupcake shop in the mid-size Oregon town where they live. Her parents move her across town away from her best friend to an apartment above the shop they eventually name "It's Raining Cupcakes" and hope she'll be excited about the new change. Isabel would rather spend her summer traveling to exotic locations than helping prepare for the grand opening of a cupcake shop, especially since her mother has a less than stellar record for following things through to completion. When Isabel learns about a baking contest for kids where finalists get to visit New York, she sees it as her chance to finally get out of Oregon and fulfill her dreams. She gets to work testing recipes and tries to decide which she should send in for the competition -- a cupcake recipe to make her mother happy or another recipe that reflects her own exotic, adventurous tastes. It's Raining Cupcakes isn't all sweet as the cover would lead you to believe. Schroeder uses a complicated mother-daughter relationship to propel her novel. Isabel's mom isn't exactly the model of stability. She's rather indecisive, directionless, and seems to suffer from depression. Isabel often mothers her own mother and because of this she must unfortunately act more grown up than her years. Isabel usually relies on her father and grandmother when she needs advice and guidance. For Isabel's family the cupcake shop remodeling project is more than just a remodeling project on a building, it is also a relationship rebuilding project. Throughout the novel, Isabel deals with the typical struggles that most tweens face, and I think that middle grade readers will be able to relate to Isabel's character. Isabel is jealous of her best friend, worries about her appearance and wants to spread her wings and test the waters of independence. Isabel deals with stress and comes to terms with her feelings by writing verses in a "passport-holder-turned-notebook." These verses and a few knock-knock jokes thrown into the mix, help break up the pages and add to the interesting and fun text. Filled with substance and sweetness, this book has it all, and it is a wonderfully satisfying summer read for kids and even adults. I especially love how the titles are named after tantalizing cupcakes - Cherries Jubilee Cupcakes, Old-Fashioned Vanilla Cupcakes, the Dr. Seuss Cupcake. The book certainly leaves you craving a special cupcake treat, and Schroeder even includes two recipes in the back of the book for those that might feel inspired to bake after reading. (I secretly wish she would have included more!) 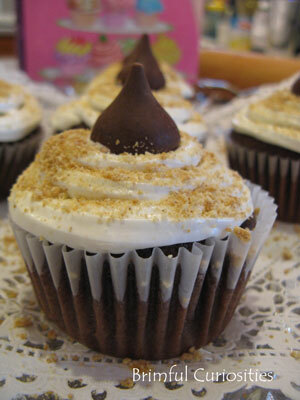 Since I enjoy experimenting with new recipes, I tried out her S'mores Cupcakes recipe. These cupcakes are completely from scratch and look pretty yummy finished, as you can see in my photo to the right. I did find them a little too sweet for my taste though, so I think I'll search for an alternative or maybe try out Schroeder's Grandma's Applesauce Cupcake recipe next time I'm craving cupcakes. I'm open for recommendations, so if you have a favorite cupcake recipe please send it my way. I received a new covered cupcake tin for my birthday that I want to use! Though this is completely unconnected to the above story or publisher, if you are in the mood to enter your own cupcake recipe contest, I just learned that Duncan Hines is holding a "Red® Carpet Cupcake Challenge" now through July 21, 2010. Visit www.duncanhines.com for complete rules and information. Looks like it is only open to ages 18+ though, so if kids wanted to participate, it would need to be a family project. My daughter is really enjoying the book! I think it was the best book i have ever checked out of the library. But i dont like the ending. I hope they make another book of cupcakes. I also don't like the ending. I really hope that they create a series of these types of books.!!!!!!!!!!!! I loved the book but hated the ending i mean really i would kind of like to know if she won or not. I mean come on that makes me mad!!!!!!! !